MIDI protocol and asynchronous serial interface has many similarities, so users can use the micro-controller UART pin to send MIDI event information. MIDI adapter plate provides MIDI – IN and MIDI – OUT connection, and MIDI THRU port. MIDI – port is light IN isolation, to prevent the ground loop. 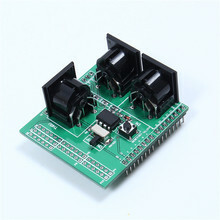 MIDI adapter plate can be installed directly like a shield at the top of the Arduino board: connect MIDI – IN/THRU to for Arduino hardware RX pin, connect MIDI – OUT to TX. It Arduino data and analog pin, power bus and the bus can transfer out. The RUN/PGM switch can let users on the forArduino board serial port programming, without having to remove the board.